Born in the 1970's in southwest Detroit, DJ Rolando, real name Ray Rocha grew up in the Hispanic district heavily influenced by his cultural latin rhythms and percussion. Encouraged from an early age by his musician father, he pursued his own interest in music and became well known and respected within the community. After, through "The Wizard" Jeff Mills, he discovered the techno sounds and he was introduced to "Mad" Mike Banks. So Rolando a.k.a. Aztec Mystic promptly became a member of the Underground Resistance crew. Soon his first opportunity came to cross the Atlantic and his speedy proficiency on the turntables wowed audiences worldwide earning him respect and notoriety within the industry as a whole. 'Knights of The Jaguar' although not Rolando's first release on UR turned perceptions of techno on their head, breaking into other genres of dance music and becoming a classic. With Gerald Mitchell, he created the label 'Los Hermanos' ('The Brothers' in Spanish), too. 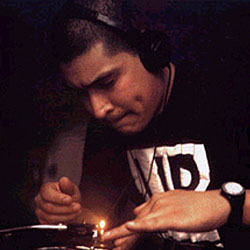 But, as of January 2005, Rolando left both Underground Resistance and the Los Hermanos project taking his own direction working solo. Now, he is to release a double mix compilation that will be out in late April on NRK. The title ‘From There To Here And Now’, means that Rolando has crafted a collection of old and contemporary electronic classics.